Persimmons, the quintessential winter fruit, bring both color and flavor to this delicious holiday salad. The candied ginger, goat cheese, and spiced nuts add some excitement to its traditional Italian flavors. Shopping seasonally and, of course, locally whenever possible saves fuel, water, and other energy costs from not having food trucked in from far away places. In a small bowl, stir together the vinegar, agave nectar or honey, salt, and pepper until well blended. Whisk in the olive oil until mixture has emulsified. Set the dressing aside. Melt the butter in a medium pan over medium-high heat. Add the walnuts and cook for 3 minutes, stirring constantly. Add the sugar, spices, and salt and stir for 1 more minute. Transfer the walnuts to the baking sheet, making sure the nuts are separated. Let cool for at least 15 minutes. In a small bowl, combine the goat cheese and candied ginger. Cover and place in the refrigerator for 30 minutes, or until ready to serve. 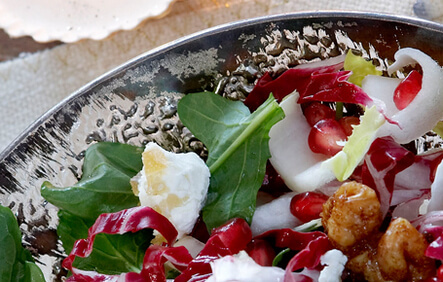 Place the arugula or baby greens, endive, radicchio, persimmon pieces and pomegranate seeds in a medium bowl. Pour the dressing over the top and gently toss until evenly coated. Place the salad on individual plates and crumble the goat cheese and ginger evenly over each. Anna Getty is a mother of two, chef, environmental advocate, green living educator and the founder of Pregnancy Awareness Month. 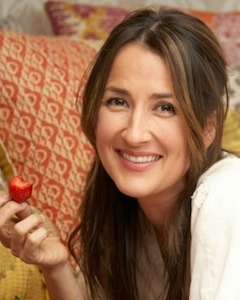 She has penned two books including I’m Dreaming of a Green Christmas and Anna Getty's Easy Green Organic.